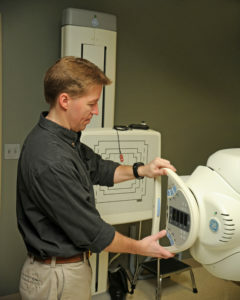 ISS, Inc., offers a full range of physics services for radiography. Equipment inspections carried out by ISS, Inc., fall under MQSA, ACR and AAPM guidelines. The reports generated by the ISS, Inc., team after these inspections are clear and easy to understand. Each report offers details about how to address specific issues, and ISS, Inc., is available for further consultation on reports if questions remain. We help facilities set up quality control programs that provide a way to test for excellent image quality. Part of this ongoing program design includes an annual physics inspection of the equipment, and review of your quality control program. This support will point to areas that need to be addressed before image problems appear. ISS, Inc., can provide suggestions for design and equipment layout to optimize the efficiency of your facility. We provide shielding designs for your radiology suites based on the number and type of exams you will be performing. We can also evaluate the shielding in an existing facility to ensure safety. Initial equipment inspections are recommended before any patient imaging is performed. Any equipment deficiencies which are discovered during the initial equipment survey must be corrected before patient images are made. The equipment must function according to the manufacturer’s specifications before you accept it. Physicist surveys should be performed annually. Our team of qualified experts will conduct a comprehensive inspection of equipment. We will provide you with a report that is complete and easy to use. The reports are customarily delivered to you within 3 days. You can trust the ISS, Inc., team to provide reliable, accurate and professional service when you need physics help. Equipment malfunctions are often encountered in the quality control tests which you perform such as kVp accuracy and exposure reproducibility. You may have issues with image quality. We provide telephone and on-site support for problems in film/screen and digital systems. With 40-plus years of providing physics support for radiology, we have gained the experience which allows us to assist the technologist and service personnel in solving problems. Allow ISS, Inc. to assist you in preparing you American College of Radiology accreditation documents and images. We have assisted many facilities in acquiring accreditation in mammography, CT, MRI and nuclear medicine. Keeping radiology professionals informed is one of our most important goals. The ISS. Inc. team can provide your staff with useful radiation safety training. Our experts regularly offer talks at the Missouri Society of Radiologic Technologists.